When writing dialogue, you might hit a spot where you wonder what to do with your periods or quotation marks. Multiple paragraphs of dialogue, quotes within quotes, and even action tags present different issues. Dialogue is a common issue that writers cross when they start out. That’s not a problem until they keep following rules they think are right without consulting blog posts like this one or, better, the Chicago Manual of Style. 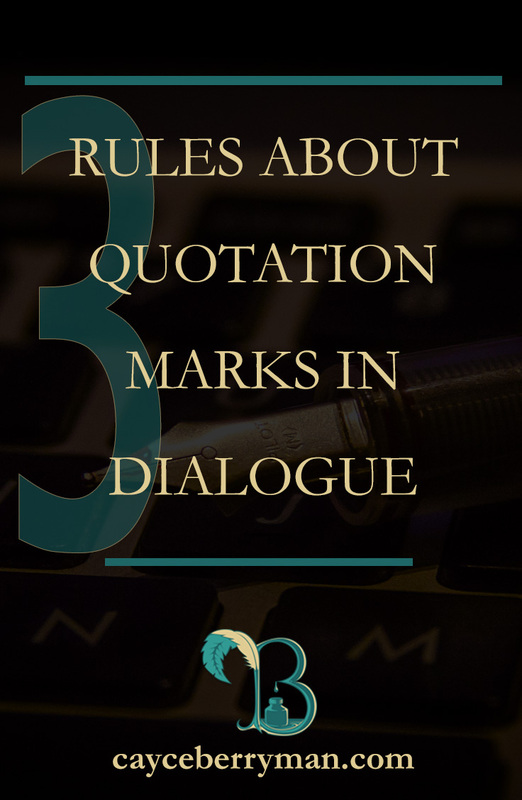 There are many online resources available, but if you’re hoping to learn how to work with quotation marks in dialogue, you came to the right place. All dialogue is normal, but that’s what we’re calling it. This consists of conversation without additional dialogue or long paragraphs of dialogue, which we’ll cover in a bit. RULE ONE: AmE (American English) uses double quotation marks in dialogue . . . always. In news headlines, single quotes are used, but in everything else, double quotation marks are used. “What on earth are you doing?” my mother asked, her hands firm on her hips. It was her “answer me” pose. I looked up from the floor and offered a small smile. “Just making something,” I tried. I used several different types of punctuation in the above example. If you noticed, the first line of dialogue above also includes something unspoken in double quotes. Scare quotes, as they’re called, are quotes placed around a phrase that elicit emphasis or attention. They can also be used as a sarcastic reference. When I say you’re “trying,” I’m not only vocalizing the word trying. I’m drawing attention with scare quotes to that particular word to provide, in this case, doubt that I actually think you’re trying. If I say it’s his “nighttime” routine to eat steak at 9 a.m., the scare quotes function as a reference to something he might have said before. He calls it his nighttime routine despite the fact that he’s eating his dinner for breakfast. Scare quotes are often written air quotes, as another way of putting it. When editing someone’s manuscript, I often see scare quotes like this in single quotes, and I’m assuming the writer intends to separate normal dialogue from these simple references. Your reader will be able to tell the difference. We’ll get to using single quotes, but that’s not where they go. “You do?” “Why did you lie to me?” the boy asked, walking closer. “You do? Why did you lie to me?” the boy asked, walking closer. You’ve seen me use dialogue tags in the above examples. If you want to read more about how to use them and different dialogue tags in general, read this post. Here, I’m only discussing the basic format regarding quotation marks and punctuation. Dialogue tags are part of a sentence. The written dialogue has punctuation, yes, but think of the dialogue tag as an added phrase in the punctuated sentence. Periods will be the only unique ones here. If you include a dialogue tag, the period is replaced with a comma. The reason for this is because periods signal the end of a sentence. Remember how I said to think of the dialogue tag as part of the sentence? Well, this supports that idea. Use a comma. CORRECT: “Hey, come over after school,” he said. INCORRECT: “Hey, come over after school.” he said. Did you notice in that last one that I took out the dialogue tag? I see this one a lot more often than I should, and I haven’t read anything that has introduced that as a style choice. When writing dialogue, you can have an action tag (which we’ll talk about soon) or a dialogue tag, or nothing at all. In the last example, what was used was a dialogue tag, and that’s incorrect. I’ll talk more about it below, but for now, understand that it’s wrong. Question marks and exclamation marks don’t change. With dialogue tags, you’ll still have the period at the end, so you punctuate the dialogue normally. CORRECT: “That’s my hat!” he said. CORRECT: “Where are you going?” she asked. INCORRECT: “That’s my hat!,” he said. Action tags are used as a variation of what you can use within dialogue. If you want to know more about using them, read this post. It can get boring to go back and forth with who said what, and it actually sounds stiff. Action tags allow your characters to exist and interact with their environment while they speak, which brings your story to life. So, use action tags. Don’t just use them to make your dialogue different, either. Make sure it makes sense. You don’t need a grand design for your character to sneeze or anything, but consider your character as a being in an environment. If they don’t move, they don’t move. But, if they do, let them. I mentioned this in the dialogue tag subhead, and I’m emphasizing it here. Action tags are not treated equally because they aren’t equal. Your character isn’t punching these words, they’re not spilling juice on these words, and they’re not sitting on these words. So, your action tags are going to be separate from these words. The different examples show you different ways of using action tags. You don’t have to have additional dialogue after the action. That’s just how I ended up typing it all. Whoops. If you’ll notice, the last two lines of dialogue look different, but they’re both correct. Why is that? They’re variations of the same thing. When you want to use a simultaneous gesture within dialogue, action tags are formatted differently. Em dashes (not en dashes and not hyphens) are used to separate the dialogue as a sort of aside to the speech. That’s why it’s not punctuated before or after the first set of closed quotation marks; the sentence is still going. In the second correct example, the sentence ends. Jake squeezes “my” shoulder after saying he doesn’t know what to do, then he says I have to figure it out. Both are correct, but they perform differently within context. The other examples should be self-explanatory. Commas aren’t used as they are with dialogue tags because it’s an action tag. Similarly, action tags are separate from the speech, so it’s not lowercased, nor can it go without a subject. It’s a new sentence, so it needs a new subject. She is your subject in that first example. RULE TWO: AmE uses double quotes for dialogue, and single quotes identify dialogue within dialogue. Sometimes, someone speaking quotes someone else. In AmE, this is when single quotation marks come into play. “Don’t open that door.” Jerry stepped toward his brother, his finger pointing at the half-turned knob. If you have dialogue within dialogue within dialogue, you use double quotes. An easy way to remember this without confusing yourself is to alternate. You begin with double quotes then use single quotes within that, double quotes within that, and so on. RULE THREE: Dialogue that spans multiple paragraphs use open quotation marks in each new paragraph and closing quotation marks only in the final paragraph, when the dialogue ends. “One day, when the cold, dark nights turn the grass to dust and the rock to rubble, you will ask what you did to deserve a fate of death in the abyss. You’ll ask why you failed to heed my warnings, why you denied me the right to the wealth of the world as it thrives, and you’ll ask if perhaps I would have saved your little world. “You will ask, and I will not return to you. I will have made it to planets beyond, saving them as you refused to save your own.” The pale man pulled on his suit coat, his eyes reflecting the metallic blue rhinestones on it. “You call me crazy now, but wait. Just wait until you wake in darkness and sleep in pitch. Wait until your cries go unanswered and your dreams become nightmares that you never escape.” Silence swept across the auditorium, and as loud as his shiny suit coat was, even it seemed to dull in the quiet. No one spoke, and those who noticed couldn’t decide whether it was in disbelief or a creeping fear. Dialogue comes in many forms, and it can be confusing when you start to do the tricky stuff. It’s okay, though. Do a bit of research and master it. I haven’t even mastered it. I still have to look this stuff up as a reminder every now and again. The point is that you keep working on it and play with it. The idea is to make dialogue easy for your reader to understand and be consistent with what you write. Do that, and you’ll have succeeded in one thing. The next step is to improve.